Turn on both Solo and Controller. Wait until they connect. Open a web browser such Safari or Chrome, enter “10.1.1.10:5888″ in the address bar. 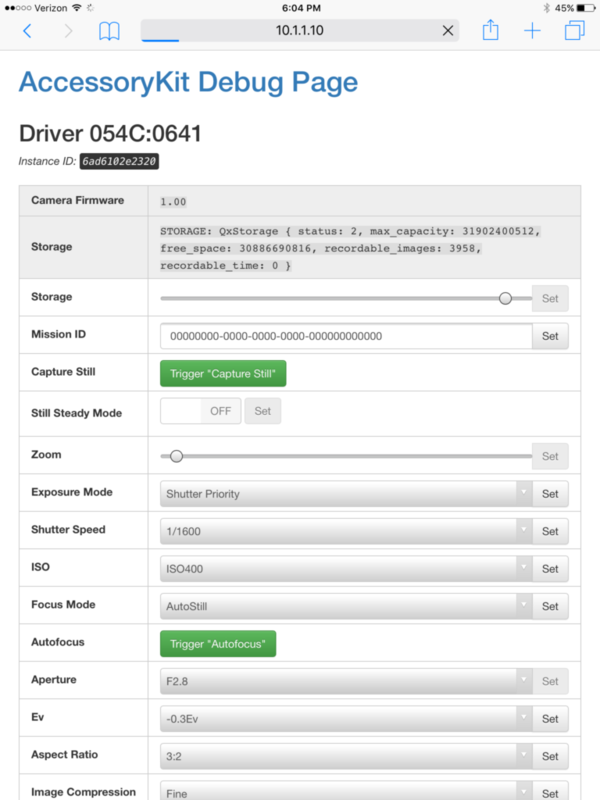 The Beta Camera Control Web App will appear. Scroll down to the Media State option. Set it to “on” by activating the toggle to the ON position and clicking the Set button. 56164a74-dcce-4303-971D-ec0c3e3136da in this example, is the mission ID. The combination of numbers and letters will be different for each mission. DSC#####.JPG is the name of each picture. The images can be downloaded by clicking on each link or using a link downloader such as the Chrome extension uSelect iDownload (not available for iOS). 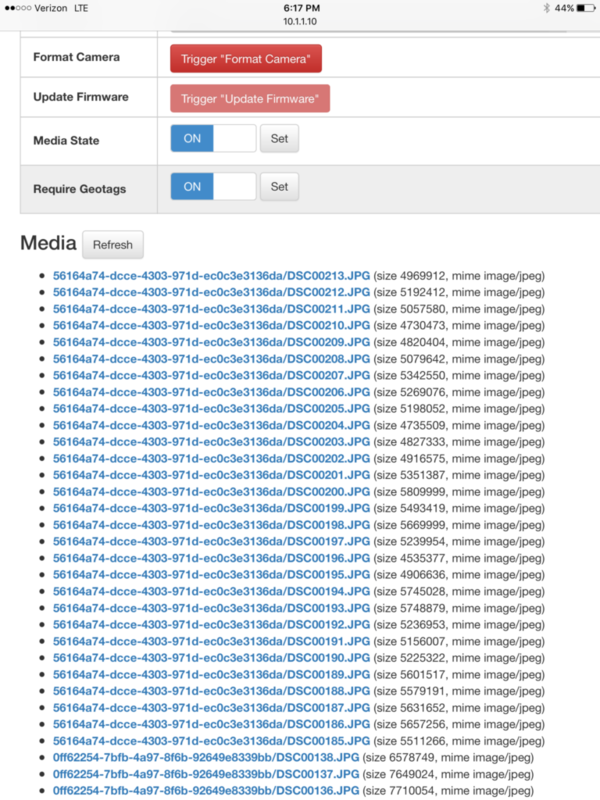 Note: “Media State” must be turned off to capture images or change camera settings. Change desired camera settings from dropdown menu. 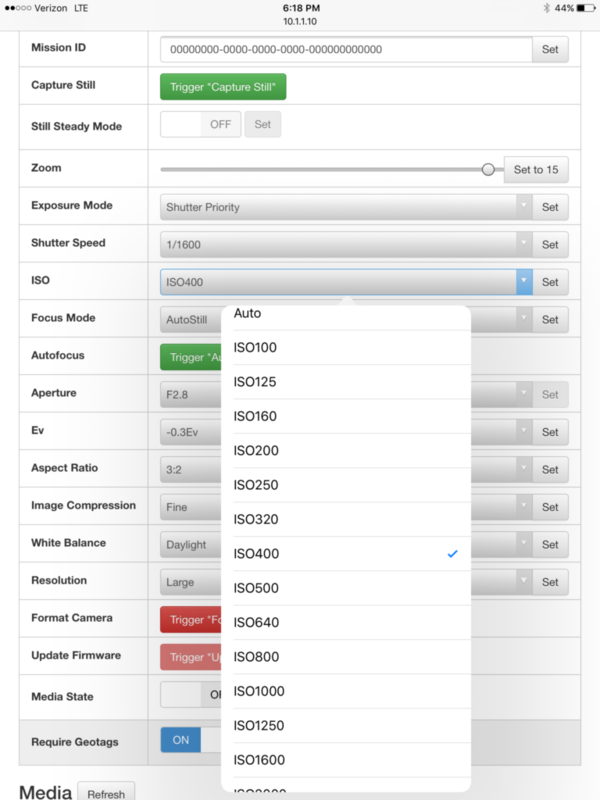 We only recommend changing Exposure Mode, Shutter speed, ISO, Aperture and/or EV. Press “Set” to save each change. Refresh page to confirm that changes have taken effect.Note: Camera settings will return to default every time Solo restarts.